The wisteria is well loved in Japanese literature. Constructed from bamboo or wood poles, so we can walk under it and enjoy the blossoms as they hang down. Click on the photo to see some more ! Click on the photo to see more versions ! Fuji Musume (“Wisteria Maiden”) is a famous classical dance out of the Kabuki theater in Japan. 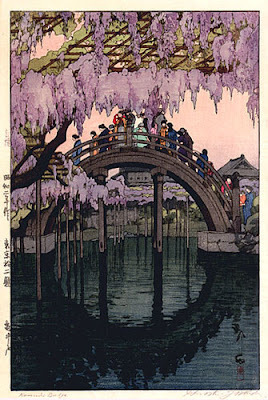 Fuji (wisteria) Musume (maiden) was first performed in 1826 at Nakamura-za, Edo and was originally performed as one in a series of five dances. Later in 1938, Onoe Baiko VII, the most famous Kabuki actor during his time, became associated with the dance after his portrayal of Fuji Musume at the Kabukiza Theater in Tokyo. His choreography and refinement of this dance helped to make it stand out and remain today as one of the most popular and famous Kabuki dances. The story begins in Otsu, an area in outside of Kyoto and around Lake Biwa. Otsu is a city famous for its paintings. People would stroll its art-lined streets, viewing the beauty of the artisans works. One painting in particular, that of the wisteria maiden, caught the eye of a male passerby. As he gazed upon the painting, the Wisteria Maiden became infatuated. So infatuated in fact, that she came to life, stepping out of the painting. The maiden is dressed in long flowing kimono; black-lacquered bamboo hat and carrying a beautiful branch of fuji (wisteria). She writes beautiful, heartfelt letters to her love. The letters however go unanswered. The story continues on as she dances under a beautiful pine tree, covered in wisteria. The dancer expresses the emotions found in unrequited love in the manner of women of the Edo era (1603-1868). Eventually, sadness and despair take over our maiden and, heartbroken, she returns to the painting. Her return to the painting remains the last pose of the dance. The Fuji Musume dance is accompanied by Nagauta music. Nagauta is the most important school of music in Kabuki theater as it has developed in conjunction with Kabuki. © 2007 by Melanie Shintaku. . 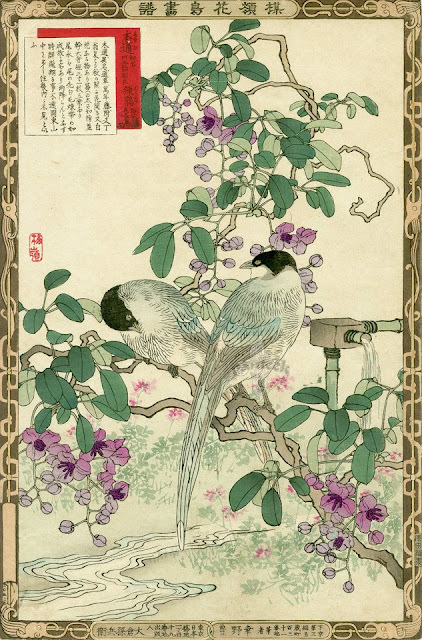 The wisteria entangles a pine tree - an old symbol in waka poetry for the Fujiwara clan　藤原 and its trusting relationship with the imperial court (the evergreen pine). Many artists have depicted this famous bridge, which was destroyed in WWII and has since been rebuilt. In one text, Issa copies this haiku with the prescript, "Toogan Temple wisteria temple solicitation." 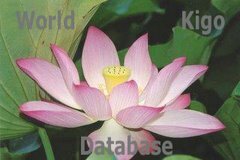 His point in the haiku, perhaps, is that Nature gives its gifts freely--the wildflowers in the light--and has nothing to do with the money-making of the Buddhist temple with its wisteria trellis and request for donations. Key is 後ろ明り　the back light, that implies Buddha is existing. Buddha lights up everything, wisteria as well as wild flowers . Temple Toogan-Ji 東岸寺 藤勧進 in 木更津市 in Kisarazu Town, Chiba 中央１丁目 東岸寺 . There is a stone memorial of this haiku at this temple in Kisarazu. The abbot of this tempel was a friend of Kobayashi Issa and they held a Wisteria Haiku Meeting 藤見句会 with eight people there, when the above haiku was penned. Prince Brave of Yamato was once trying to cross Tokyo Bay to Kazusa when his boat was suddenly attacked by strong waves, almost sinking it. At that moment, Princess Oto Tachibana jumped into the water in an attempt to pacify the sea god and save the Prince's life. It worked and the fierce waves subsided immediately. After landing, the Prince went to Mount Oda to look over the sea and reminisce his lost love. The fact that he stayed there for many days gave rise to the place name Kimisarazu (meaning "prince-didn't leave" in Japanese). This later turned to KISARAZU. 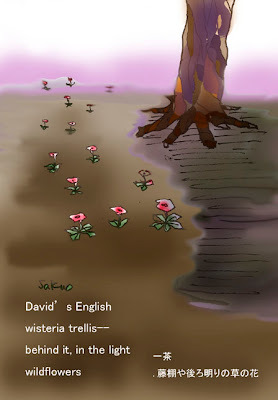 Read more wisteria haiku by Issa here ! 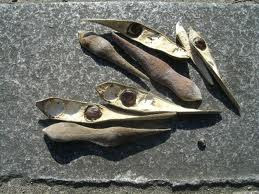 They look almost like beans in a sheath. The town of Seki 関 in Gifu was quite famous for its wisteria flowers, but when Basho arrived at Ogaki, it was autumn. So he composed this poem for his host, Hirose Izen 広瀬維然 from Seki. For Basho, anything at hand was worth a subject for a greeting poem and a haikai session. This shows his true haikai spirit. The priest Soogi 宗祇 Sogi (1421 - 1502) is famous for his waka about wisteria blossoms.
. Hirose Izen 広瀬維然 at Seki 関. Last year I have visited the Temple, Toogan-ji. I saw the wisteria trellis, but I couldn't understand what Issa has felt there. I could catch Issa's feeling among Buddha's back light. My feeling coincide with Issa's feeling under the wisteria trellis at Toogan-Ji.